This entry was posted in 0 Star Rating (DNF), 2019, ARC, Book Reviews, Netgalley and tagged 0 star rating, arc, book review, bullying, contemporary, death, dnf, dnf review, e.e. 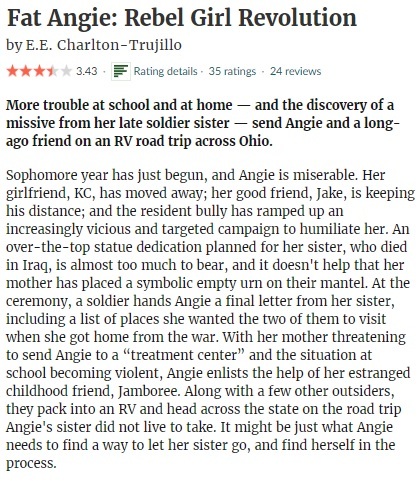 charlton-trujillo, family, fat angie, fat angie: rebel girl revolution, fiction, lgtb, mental health/illness, Netgalley, published in 2019, series, suicide, young adult by Yvo. Bookmark the permalink. Great review what a shame you had to DNF it. Sorry you had to DNF this one Yvo though I totally understand why especially with that overload of elements in a character/story. I feel bad for doing so, but I don’t think my opinion would have improved much by making it to the final page… It’s probably a case of the story not being a right fit I guess. Sorry this one didn’t work for you. I wish Angie had been a better character. 😦 You wrote a very nice review for it, though! As a side note — Is it weird that when I read this title I immediately imagined “Fat Angie” as “Fat Amy” from Pitch Perfect? I do get that reference! Sadly Angie wasn’t able to convince me, but that might have just been me I guess.